Order pipe flange gaskets for ASME B16.21 pipe flanges and flange fittings. Sizes are available for class 150#, 300#, 400#, 600#, 900#, 1500# and 2500#. To order, simply provide your Hi-Tech Seals representative with the class #, nominal pipe size, material and quantity. For more information, visit our pipe flange gasket product page. Custom gaskets can be manufactured based on a sample or from metal dimensions. If you are providing a sample, our team can rapidly plot the dimensions of your gasket on our LaserQC®. Our drafting team will adjust the dimensions to remove flaws, then send the CAD file directly to our production team. 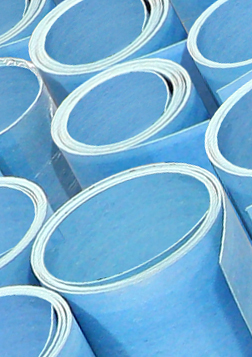 From there, we will select the best material from our extensive inventory of sheet stock. Gaskets can be manufactured in as little as 24 hours, upon request. Rush charges may apply. If you are providing dimensions, complete the appropriate Custom Gasket Measurement Sheet listed below. Once completed, the sheet can then be faxed or emailed to a Hi-Tech representative.